What is Measure U and what does it fund? The current Measure U is a ½-cent sales tax approved by voters in 2012 that expires in March 2019. The proposed Measure U is a 1-cent sales tax that would replace the existing Measure U. The proposed Measure U will be on the Nov. 6, 2018 ballot and will help to maintain and enhance City services, including public safety, and allow the City to invest in youth, affordable housing, and inclusive economic development. It is expected to raise approximately $95 million per year. Measure U is a general tax; the revenue it produces would be deposited in the City’s General Fund and may be used for any municipal purpose. What does the current Measure U fund? Revenue from the current Measure U supplied $47.3 million in annual revenues to restore City fire, police, parks and library services. The primary recipients of Measure U funding have been public safety agencies. Measure U currently pays for 195 positions in the Police Department, 90 in the Fire Department and 137 in Youth, Parks & Community Enrichment (YPCE). In the 2019/20 budget year, Police, Fire, and YPCE will face significant staff cuts if Measure U is not renewed. What has the City done to become more efficient? The City currently employs 9.3 employees for every 1,000 residents of Sacramento. That compares to 11.5 employees for every 1,000 residents in 2007/08. The City has also eliminated retiree health benefits for new employees in every union except firefighters. In addition, since 2015, all City employees are required to fully fund employee contributions towards their retirement costs. All public safety employees pay an additional three percent of the City’s retirement cost, while all but 160 non-safety employees pay an additional one percent. What kind of oversight would there be over Measure U spending? The City currently requires independent audits of Measure U spending. These are reviewed by a five-member committee. The City Council will establish an oversight committee for the new Measure U as well. Would the state be able to take this money from us? No. By law, locally approved sales taxes cannot be taken away by state government. The entire amount will be used in Sacramento. How much extra would I pay for a $100 purchase? The additional 1/2-cent sales tax being proposed for Measure U would add 50 cents to a $100 purchase subject to sales tax. The total Measure U sales tax after November would be $1 on a $100 purchase subject to sales tax. 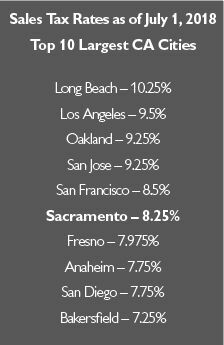 If approved, the total sales tax for the City of Sacramento will be 8.75%. Have other cities passed similar taxes? Since 2012, 111 California cities have passed general tax increases ranging from 1/4 cent to 1 cent. Additional information can be found at Measure U.